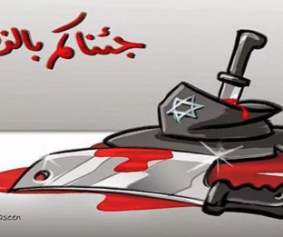 Left: Arabic Caption: “We’ve come to slaughter you.” Published after the massacre of four rabbis and a Druze policeman in Jerusalem in November 2014. The Palestinian terror wave is not letting up, and fighting it more effectively requires a close examination of its roots and its objectives. While not baseless, the explanation that it is a spontaneous outbreak stemming from continued Israeli control of the territories, building in the settlements, the horrendous Jewish terror attack in Duma, economic hardship, or the lack of a political horizon, does not suffice. If any or all that were true, then the Palestinians could have accepted far-reaching offers to establish a Palestinian state, or, at least, to return to the negotiating table; alternatively, the terror wave would already have erupted much earlier than it did. In reality, the Palestinian leadership with Mahmoud Abbas at the helm, which rejects negotiations and now admits that it spurned the offers of statehood, stands unequivocally behind the ongoing stabbing and car-ramming attacks, which have been added to the stone-throwing and hurling of firebombs which characterized the problematic security situation until October 2015. With the support of a large majority of the Palestinian population, this leadership encourages the continued attacks and does not hide its satisfaction with them. What is occurring resembles the cooking of soup. First one has to heat the soup to the point that any slight increase in the heat will bring it to a boil. Likewise, in a gradual process, the basic elements of the Palestinian identity – as the leadership views them – are instilled in the psychic infrastructure of the Palestinian population as a whole, and particularly of the young people. According to these principles, the mission of the Palestinians is to hasten Israel’s inevitable disappearance through a constant struggle in which all means are permissible. The Palestinian leadership’s ceaseless incitement guarantees that the heat will always be very high. How, though, does one bring things to a boil and at the same time make sure the soup does not burn? The tried-and-true way to reach a boiling point is the Al-Aqsa issue. It worked in September 2000. It worked in 2014 (when the spate of car-ramming and stabbing attacks reached its apex with the synagogue massacre of four rabbis in Har Nof) when Abbas, stressing to Fatah members in Jerusalem the need to prevent “herds of settlers” from contaminating the holy site, invoked a Koran verse that is interpreted as sanctioning jihad. And it worked in September 2015, when Abbas again spoke of preventing settlers from defiling Al-Aqsa. The Palestinians continue to argue about what level of heat will ensure a quality soup. Unlike Hamas, which wants to stoke a general conflagration with terror attacks using firearms launched from the areas under Fatah control (see the recent arrests in Abu Dis, etc. ), Abbas favors a calibrated bubbling that will not boil over. He fears that all-out terror will make it hard to retain Western support, undermine his rule, and strengthen Hamas. The intra-Palestinian code Abbas uses to ensure the right level of heat is “popular (peaceful) uprising.” Every Palestinian understands that this code, which was espoused at the Sixth Fatah Congress in 2009, refers to terror without firearms – that is exactly what has been happening over the past three months. So far Abbas has rightly assessed that this relatively low flame will not diminish Western support for him and for the Palestinian issue in general (see recent statements by Secretary of State Kerry and the resolutions of the Greek parliament). On the contrary, it revives interest in the Palestinian issue; enables progress on the unilateral path; does not disrupt the ongoing security cooperation with Israel, which is key to constraining Hamas; and, moreover, does not shake the Israeli center-left’s commitment to a solution that is generous to the Palestinians. Even if the Israeli center grasps more and more that there is no partner for an agreement, it will view Abbas as a positive symbol; avoid stating the bitter truth about his role in encouraging the terror; cling to ideas that lack all feasibility, like unilateral separation, as an alternative to an agreement; keep pointlessly scaring itself about a need to decide between a Jewish state and a democratic one (the Oslo agreement created a political framework for the Palestinians while leaving responsibility for Israeli security in Israel’s hands); and divert attention to escapist subjects such the ardent interest in the faulty Miss Universe declaration and other matters – just not Palestinian terror. Putting a stop to the terror wave requires making clear to Abbas and the Palestinians in general that the benefit of sustaining it is declining and the cost is rising. Destroying the homes of terrorists and beefing up the Israeli security forces’ presence is not enough. It is also vital, for example, to clamp down on Palestinians entering Israel illegally, cut back the number of Palestinian workers in Israel, and intensify surveillance of those exiting the problematic Jerusalem neighborhoods as well as inspections of Palestinian vehicles entering jointly used roads. Such measures are not pleasant nor photogenic, but they are essential to enhancing security. 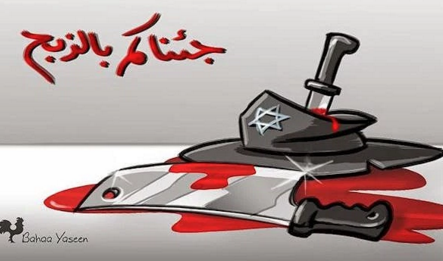 In parallel, Israel must clarify to the Palestinians’ Western supporters the role that the Palestinian leadership has played in encouraging the wave of attacks and demand that they stop supporting the phenomenon. Last week it was difficult to watch the State Department spokeswoman reject 30 senators’ request to close the PLO office in Washington by claiming that its presence is requisite to promoting the two-state solution (not for two peoples), while totally ignoring the senators’ assertions about the PLO’s incitement and payment of salaries to Palestinian terrorists and their families. The exchange was not covered in the Israeli media. * The Hebrew version of this article “התשובה למרק הפלסטיני” appeared in Ha’aretz, on December 29, 2015, and on Jan. 3, 2015, the JCPA published the English version How to Block the Palestinian Terror Wave.